Amazing price on an amazing car, so amazing I've just ordered one on a 4 year 0% PCP deal. Stand out from the (German) crowd in this Gti killer. 0-62 in 6 seconds, 151mph, 235bhp. Super stylish and don't believe the lazy myths spouted by people who know nowt about cars; I've had a 156, a 159, and a Guilietta previously and they have been ultra reliable. This has the engine and twin clutch flappy paddle gearbox from the 4C super car. Buy plenty of reading material for the long waits at the dealership getting it fixed! Yawn. For the benefit of those who don't read the listing: "don't believe the lazy myths spouted by people who know nowt about cars; I've had a 156, a 159, and a Guilietta previously and they have been ultra reliable"
This car has an 85% satisfaction level at present in the Which? Car Survey. As a matter of interest, does anybody have an example of how the 4 year pcp deal pans out? Looks good value but doesn't seem to get awesome reviews? They all seem to **** off handling, ride and even the gear change? I wanted to believe! Would love one of these. Owned a 159 in the past, brilliant cars. I'm paying £303 a month for 47 months with a final payment of £6,800 to keep the car. £4k deposit. Looks good value but doesn't seem to get awesome reviews? They all seem … Looks good value but doesn't seem to get awesome reviews? They all seem to **** off handling, ride and even the gear change? I wanted to believe! The TCT gearbox "learns" your driving style, and users on the alfa forum report that after a couple of weeks of driving a new car with it fitted it changes up/down to suit you driving much better. The box itself is pretty amazing technologically, and it has launch control for extra fun! As for the ride, well, its a sports car, you don't buy it for gliding over bumps, and the Giulietta handling has never let me down when I've been pushing the car towards, but not beyond, its limits. Plus don't forget £3k of options just to get, paint, leather seats and bose sound and xenons never met mind the £900 for an extra trim upgrade. Plus don't forget £3k of options just to get, paint, leather seats and … Plus don't forget £3k of options just to get, paint, leather seats and bose sound and xenons never met mind the £900 for an extra trim upgrade. Whilst these are utterly gorgeous cars, to say these will be as reliable as anything German is just as bad as saying they always break down. I've always owned Alfa, and currently have a 5 yeah old MiTo 155. Fantastic car, but in those 5 years it's had a gearbox rebuild, battery failure, steering column failure, a new wishbone and front suspension mounts. Plus there's the horrific stone chipping from the red paint. Again, they're fantastic cars, and I'd never own anything but an Alfa, but you need to be aware that these cars will need more TLC than a 3 series or a golf GTI. The TCT gearbox "learns" your driving style, and users on the alfa forum … The TCT gearbox "learns" your driving style, and users on the alfa forum report that after a couple of weeks of driving a new car with it fitted it changes up/down to suit you driving much better. The box itself is pretty amazing technologically, and it has launch control for extra fun! As for the ride, well, its a sports car, you don't buy it for gliding over bumps, and the Giulietta handling has never let me down when I've been pushing the car towards, but not beyond, its limits. I believe they were comparing to Golf / Leon handling characteristics. Can you counter with a positive review from a reputable review site? What car and Autocar arent at all glowing. 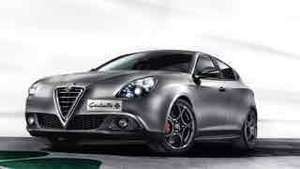 Do agree it is a great looking car externally and I would rather have an Alfa than most other marques. The discount and the free finance are positives. ​I'm sorry but with added extras it brings it too close to golf R territory for myself liking. It will also depreciate like a stone aswel as most Alfas do unfortunately, talking from previous experience with GTV ownership. It's a good discount but this is the price that it should have been marketed at in the first instance IMHO. ​I'm sorry but with added extras it brings it too close to golf R t … ​I'm sorry but with added extras it brings it too close to golf R territory for myself liking. It will also depreciate like a stone aswel as most Alfas do unfortunately, talking from previous experience with GTV ownership. It's a good discount but this is the price that it should have been marketed at in the first instance IMHO. TBH those are the exact options i would have gone for as well although may have settled for the alcantara mix. Good points though. Think it comes down to how much value you put on the Alfa badge and external looks. I am considering the R but the looks don't inspire that much. Residuals should be better though. Sorry you've been unlucky with yours, though I feel the pain with red paint and stone chips! My 2011 Guiletta has literally cost me £0 in terms of maintenance/repairs in the 9 months I've owned it. My 159 needed £350 services as scheduled, and brake discs, pads, and an alternator in 2.5 years. My 156 needed a radiator, and suspension arms in a similar time period. With Alfa launching the £50k Giulia in less than a year as a BMW competing executive company car alternative it can't afford to build unreliable cars. These cars seem to do very well in holding their value compared to older Alfas (my £24k when new 159 cost me £5,300 five years later! ); the cheapest (by far) used QV on AutoTrader at the moment is £20k with 3,000 miles on the clock, with most of the rest being listed at considerably more than this new car deal! Love my old 155 2.0 twin spark, wonderful to drive but very glad it was a company car are maintenance was covered. Things may have changed now though. Whilst these are utterly gorgeous cars, to say these will be as reliable … Whilst these are utterly gorgeous cars, to say these will be as reliable as anything German is just as bad as saying they always break down.I've always owned Alfa, and currently have a 5 yeah old MiTo 155. Fantastic car, but in those 5 years it's had a gearbox rebuild, battery failure, steering column failure, a new wishbone and front suspension mounts. Plus there's the horrific stone chipping from the red paint.Again, they're fantastic cars, and I'd never own anything but an Alfa, but you need to be aware that these cars will need more TLC than a 3 series or a golf GTI. 0-60 in three electrical faults! OP, please clarify the deposit and ongoing monthly payment values. Lovely looking cars... but reviews aren't that amazing really. Still, if someone else was paying for repairs, I'd have one. I have done, but again; £4k deposit, £303 p/month x 47. Final £6800 to keep the car. To be clear, that is on the car I've ordered with over £3,000 of extras and for 12,000 miles per annum. And as for … And as for reliability...http://www.reliabilityindex.com/manufacturerStill, if someone else was paying for repairs, I'd have one. That page you link to, the newest Alfa it is based on is the 159 which has been out of production for nearly 4 years; it doesn't even take mito and Giulietta reliability into account. You may as well compare a BMW Mini with a BL one! ​So an honest review by yourself well done.Im the same hame a few performance cars and loved them but always had issues.Nice car I'd have to put my money into an amg a class.Mercs seem to be on a roll with quality and reliability now.Alfa are just a Fiat in disguise. ​So an honest review by yourself well done.Im the same hame a few p … ​So an honest review by yourself well done.Im the same hame a few performance cars and loved them but always had issues.Nice car I'd have to put my money into an amg a class.Mercs seem to be on a roll with quality and reliability now.Alfa are just a Fiat in disguise. Why is that an "honest" review, based on the experience of owning one Alfa, whereas mine, based on owning 3 and about to buy my 4th, isn't? Oh, and you show yourself to simply be parroting lazy stereotypes; care to explain which Fiat you believe the brand new Giulia to actually be?! Why is that an "honest" review, based on the experience of owning one … Why is that an "honest" review, based on the experience of owning one Alfa, whereas mine, based on owning 3 and about to buy my 4th, isn't? Oh, and you show yourself to simply be parroting lazy stereotypes; care to explain which Fiat you believe the brand new Giulia to actually be?! Sorry you've been unlucky with yours, though I feel the pain with red … Sorry you've been unlucky with yours, though I feel the pain with red paint and stone chips! My 2011 Guiletta has literally cost me £0 in terms of maintenance/repairs in the 9 months I've owned it. My 159 needed £350 services as scheduled, and brake discs, pads, and an alternator in 2.5 years. My 156 needed a radiator, and suspension arms in a similar time period. With Alfa launching the £50k Giulia in less than a year as a BMW competing executive company car alternative it can't afford to build unreliable cars. whilst I wouldn't never buy a Alfa , I do however admire your passion for them ,and for that I applaud you !!! The reviews are pretty unflattering. Maybe if it had been reviewed as a £20k car rather than £30k one they would have been a little more forgiving.